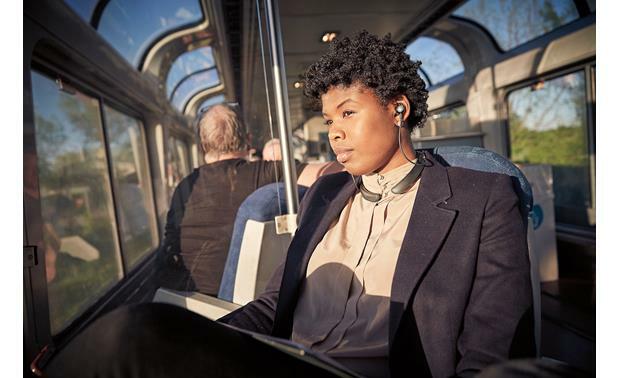 Leave it to Bose® to bring us our first in-ear headphones with both Bluetooth® and noise-cancelling technology. 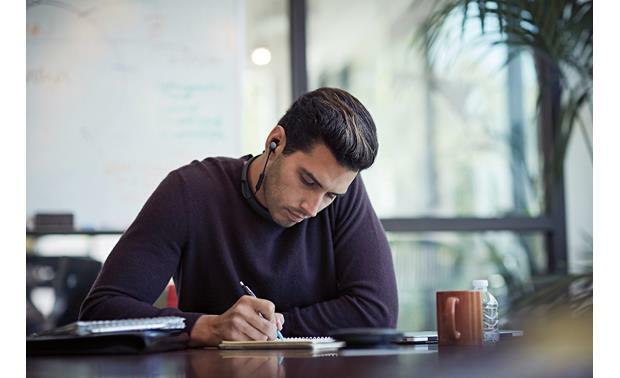 The QuietControl® 30 wireless headphones offer the company's famous noise cancellation, with precise control over how much external noise they block out. Just tap the in-line remote to adjust the level of cancellation to compensate for the distractions around you. 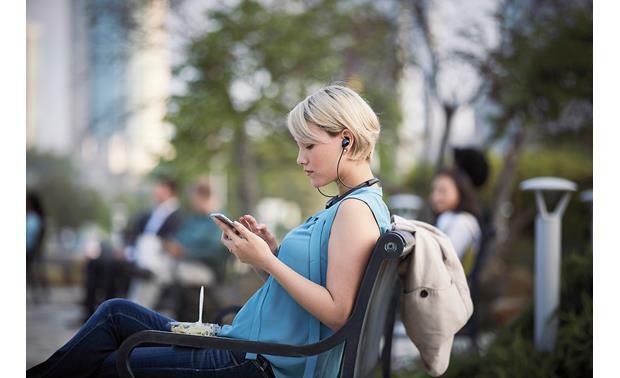 Your music and podcasts play wirelessly from your phone or mobile device. Block out distractions and listen wirelessly with the Bose QuietControl 30 headphones. I got a chance to try these headphones out, and found them surprisingly light, considering all the technology packed inside. 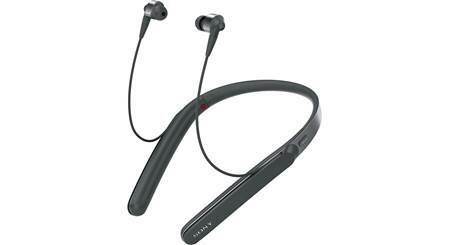 The sturdy neckband houses the rechargeable battery and internal circuitry, but also helps keep the headphones stable. I could move my neck and head around freely without worrying about the cord whipping around. 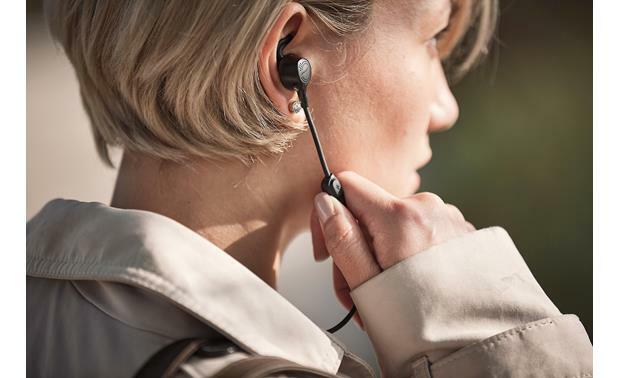 Pink Floyd's "Wish you Were Here" kicks off Crutchfield's "Headphone essentials" Spotify playlist and this track really played to the strengths of the QC® 30. As David Gilmour's acoustic guitar played along with background chords on the "clock radio," the riff sounded more startling and striking to me than it has in years — likely due to the complete silence surrounding the soundstage. When the vocals came in, then later the drums, bass guitar, and other instruments, these small headphones handled it all with graceful power. I often recommend Bose® for friends who need portable headphones, but are skeptical of in-ears. That's because Bose® StayHear®+ tips don't fit like most. The soft, cone-shaped tips stay in the outer part of your ear canal, while the stability loops holds them in place. I can personally listen longer using them than I can with many other ear tips. 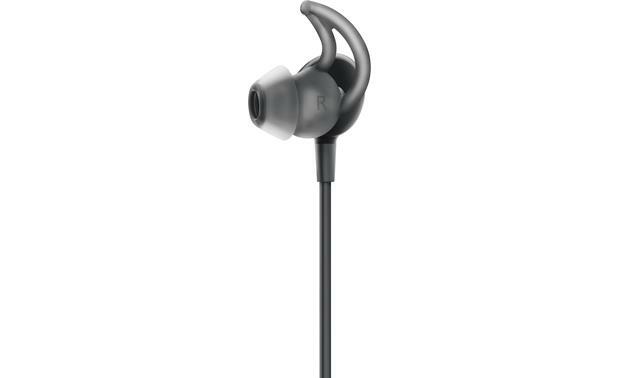 The QuietControl 30 headphones include three sizes of tips so you can find the right fit. The StayHear+ design also helps seal out external noise for better cancellation. And together with the freedom of movement offered by the neckband, they almost made it feel like music was floating around me. is it compatible with a note 8 cell phone? Earcup Width x Height 1.094" x 0.715"
Overview: The Bose QuietControl 30 wireless headphones feature proprietary Bose technologies to provide you with excellent sound quality, while controlling how much ambient sound to let in. 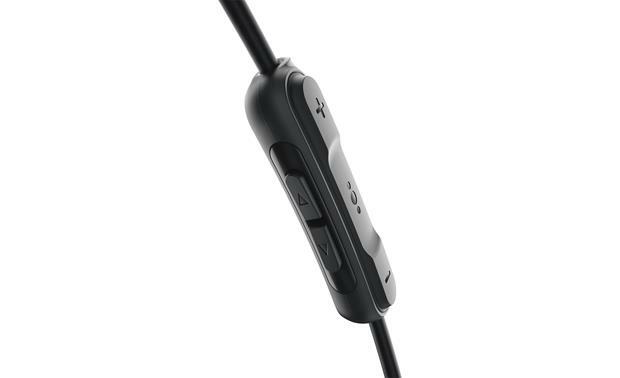 The QuietControl 30 in-ear headphones have an Apple-compatible in-line remote/microphone, and a lightweight neckband, and come with three pairs of ear tips. The headphones can be stored in the supplied zippered carrying case when not in use. 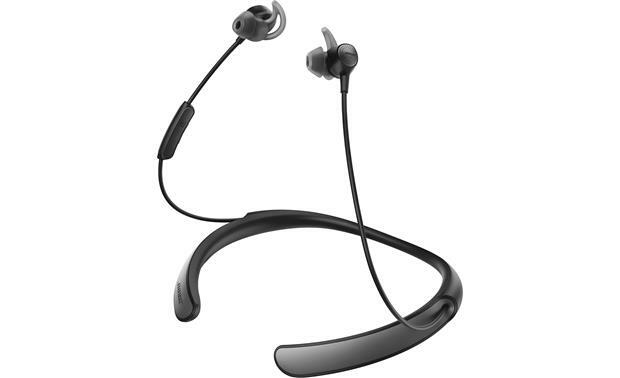 Bluetooth: The QuietControl 30 wireless headphones feature Bluetooth technology to connect to your mobile device. The wireless range is approximately 33 feet (10 meters). You can store up to 8 paired mobile devices in the headphone pairing list, and you can actively connect to two devices at once, switching between them as needed. 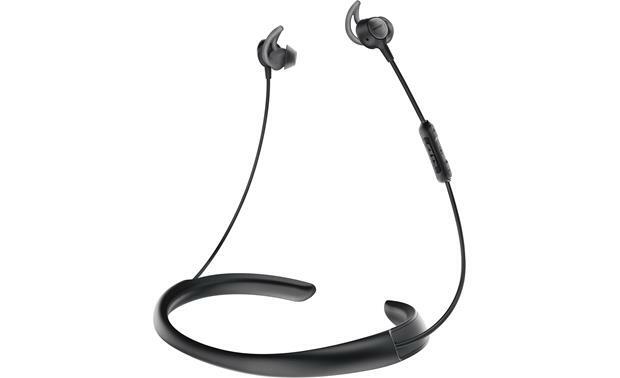 Neckband: The headphones have a lightweight contoured neckband that comfortably rests at the base of your neck. The weight of the headphones and cables is transferred onto your neck and collarbone, allowing the ear buds to gently rest in your ears. When you're not listening, you can simply take the ear buds out and let them hang from the neckband. The ANC and Bluetooth circuitry and the rechargeable battery are all contained inside the neckband, so there's no in-line control module. Controllable Noise Cancelling: The QuietControl 30 features Controllable Noise Cancelling, the next generation of Bose's patented Acoustic Noise Cancelling technology. 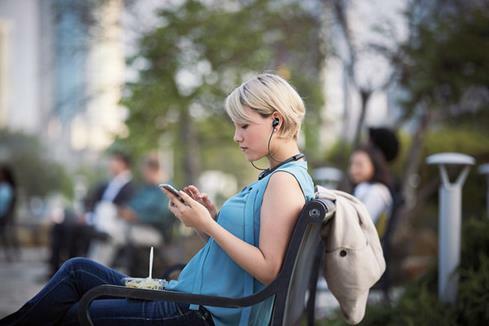 The degree of noise cancelling can be controlled by the user, either on the headphones themselves, or through the Bose Connect app (requires iOS 9.0 or later). Two buttons on the in-line remote let you select up to 12 levels of noise cancelling. On the app, you can adjust the amount of noise cancelling by sliding your finger along a 270° arc to "dial in" the precise amount of noise cancelling. StayHear+ QC Ear Tips: The Bose headphones come with StayHear+ QC silicone ear tips in three sizes (Small/Medium/Large) to help assure a more accurate and comfortable fit. The StayHear+ QC ear tips are made of the same soft silicone material as the original StayHear ear tips, but have a unique umbrella shape that creates a gentle seal at the entrance of the ear canal. Just like the original StayHear tips, the StayHear+ QCs stay securely in your ears, even during rigorous activities. In-line Remote: The QuietControl 30 gives you control over your headphones and your music. The 5-button in-line remote/microphone is compatible with iPhone, iPad, and iPod touch, and features volume up/down, answer/end call, next track, previous track, fast forward, fast reverse, and Siri voice control. The two buttons on the side of the in-line remote control the amount of noise cancelling. The microphone enables you to make phone calls and perform voice commands with your iPhone. 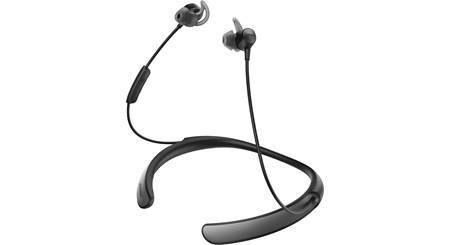 Rechargeable Battery: The QuietControl 30s are powered by a rechargeable Lithium-Ion battery in the neckband. The battery is charged with the supplied USB cable in approximately 2 hours. A fully-charged battery provides approximately 10 hours of battery life. Storage Case: The headphones come with a carrying case that protects your headphones and accessories when not in use. The case has a small inside pocket for small items, and a zippered closure. I don't know. I have an iPhone 7+ and the pair work very well together. Are these earbuds compatible with both iPhone and Apple Watch 3? I do not have Apple Watch, but if it's Bluetooth it should work. Do the ear pieces retract like the LG? No they just hange loose. Has anyone ever had these ear phones catch fire? I have a friend who had some catch fire. I had no issues using any of my apple chargers. Bose wireless earbuds noise cancelling AND equilization...Bose hearphones??? 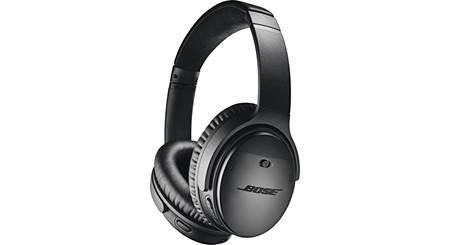 These Bose QuietControl 30 headphones are wireless noise-cancelling models that include Bose's built-in equalization for optimal sound quality and performance. If you would like to discuss further, feel free to contact an Advisor directly by phone (1-800-324-9695) or online chat. they are good in an airplane. Not somuch on my motorcycle though. I have checked it at home near the noisy kitchen exhaust... it was very effective reducing the noise ...my estimate would be up to 80%...did not have them in the plane yet. I have a tiny Bluetooth transmitter that is abour 2"X1"x 1/4" that can convert any non-Bluetooth audio source into a Bluetooth. It has a male x male 3.5mm cord that plugs into it so the audio source sends signal to the transmitter, then the transmitter sends the Bluetooth signal to the bose. Crutchfield may be able to help you purchase a tiny Bluetooth transmitter. 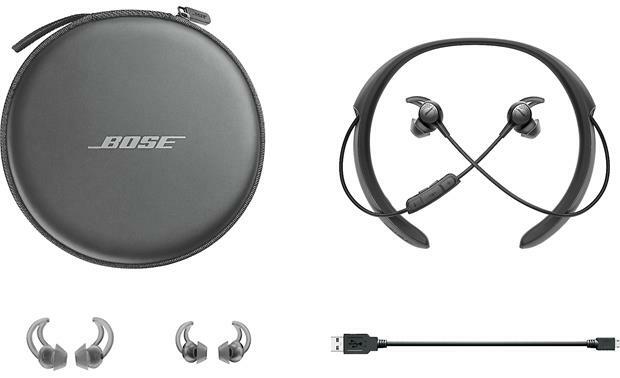 Searches related to the Bose® QuietControl® 30 wireless noise-cancelling headphones .